Surya said the anti-Modi brigade including economists have highlighted the aspirations for better-paying jobs and better price for farm produce as crisis. 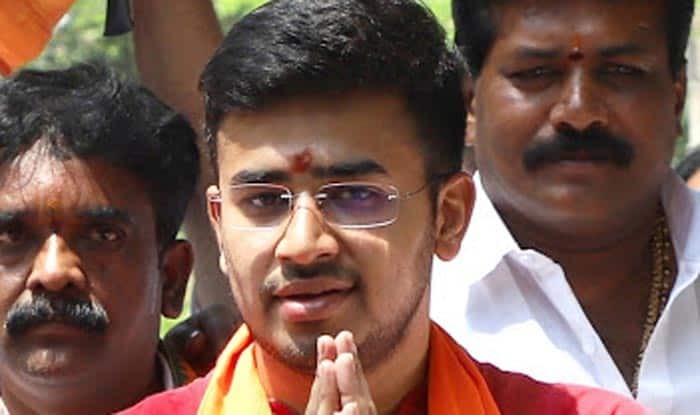 With issues of inflation and corruption successfully tackled by Modi government, people have now moved to the next socio-economic level of “aspiration beyond basic existence”, which will result in a positive vote for the BJP, according to its youth leader Tejasvi Surya who has been in the limelight after being fielded from Bengaluru South constituency. This aspiration for better-paying jobs in urban areas and better price for farm produce in rural areas has been “falsely highlighted as ‘jobs crisis’ and ‘farm distress’ by anti-Modi brigade including economists”, the 28-year-old BJP candidate said in an exclusive interview to PTI. He also hit out at the Congress over NYAY scheme, saying the party’s idea of social welfare has been the redistribution of poverty, instead of the creation of prosperity. He claimed the voters have not been enthused with the scheme because people see “nothing credible” in Rahul Gandhi’s promise. Surya said due to steps taken by Modi Government, “issues of inflation and corruption, which mattered most among voters until 2014, have now taken a back seat”. “I have been interacting with people and they are silent on these two issues. This has been first of a kind achievement of Modi government after Independence. So, the Indian voters have moved on to the next socio-economic level of aspiration beyond basic existence. This should be a probable positive vote for Modi,” he said. This has led to a big demand for better-paying jobs in urban areas and better price for farm produce in rural areas, Surya said. “These two issues have been falsely highlighted as ‘jobs crisis’ and ‘farm distress’ by anti-Modi brigade including economists. The Indian voters are thanking Modi for solving corruption and inflation problems, but asking to give better jobs and improve agronomics,” he said. Surya, who is an advocate and BJP youth wing leader, said the main issue among the voters this election is the choice between “Modi’s quest to take the country towards fast-paced progress or Congress’ regressive policies for the last five decades”. “The people of Bengaluru South have decided to vote for Modi to achieve fast-paced progress and the youth are enthused with Modi’s faith in a 28-year-old candidate to contest elections, which has sent a strong message that the prime minister wants youngsters to lead in the development of the country,” Surya said. Asked how many seats he expects the BJP to win, Surya said the party could win 300 plus at the Centre and 22 seats in Karnataka. On claims that Tejaswini Ananth Kumar, wife of late BJP leader Ananth Kumar, not getting ticket from the seat could affect BJP’s electoral chances, Surya said it will not have an impact because all leaders, including Yeddyurappa, are supporting him in his endeavour. “It takes some time for everybody to come to terms with a surprise element. My candidature was a surprise for everybody, but the beauty of my party is – once a decision is made everybody supports and work towards the goal. Hence, all leaders have blessed me and are standing by me to score a splendid win,” he said. On NYAY scheme promised by Congress in its manifesto, Surya said it is a non-starter. “I don’t think people are getting attracted to the new scheme. See, credibility matters a lot in politics. The voters make their decisions based on his idea of credibility of a candidate, and people of India see nothing credible in whatever Rahul Gandhi promises. Therefore, the scheme has been a non-starter for Congress,” he said. The idea of universal basic income is not something which is Rahul Gandhi’s innovation, Surya said adding that it is there in many countries. “Modi government has been trying to explore the practical viability of introducing such a scheme and many meetings have taken at the highest level from a very long time. Perhaps Rahul wanted to pre-empt Modi government in bringing about this scheme and running away with credit and dub him a copycat, if it implements the scheme in future,” he said. On Rahul Gandhi contesting second seat from Wayanad, Surya said this shows erosion of credibility of Congress party even in their party president’s family borough. “Rahul will meet his Waterloo in both constituencies of Wayanad and Amethi,” he added. “Even after so many years Rahul Gandhi doesn’t have confidence of winning his family borough, it just shows to what extent the credibility of the Congress party has eroded in the eyes of common people. Whether it is Amethi or Wayanad, he will meet with the same fate this election,” he said. Asked about Congress’ justification that Rahul contesting from Wayanad will unify North and South India, Surya said this is the best argument the Congress could give to justify Rahul shying away from Amethi.